We thought it was about time that we put our exclusive Faux-Fur Fleece fabric in the spotlight - a fabric we have knitted specially for Charley Chau in the UK and a key element in ensuring that our signature Snuggle Beds, Faux-Fur Fleece Day Beds and Comforters are super-snuggly! So why do we go to the extreme of having a fabric made specially for us? 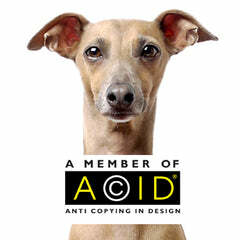 Simply because we have never found another fabric that performs as well and dogs love it! Tino enjoying a power nap on a Faux-Fur Fleece Day Bed - fluffy and fabulous! Our Faux-Fur Fleece fabric is not only super-soft and warm, it's also moisture-wicking and breathable too which means that dogs can sleep on or under it without their bed becoming clammy and uncomfortable. As you would expect from Charley Chau the Faux-Fur Fleece is also machine washable and designed to put up with a fair bit of scrabbling - as you can see in the video of Tino below! Our Faux-Fur Fleece fabric has been with us from the beginning. When we designed our signature Charley Chau Snuggle Bed we spent months and months looking for a fabric to line the cosy pocket but not a single one was good enough. So, we went to a specialist textiles company who still manufacture fabrics and textiles in the UK and they came up with this gorgeous fabric for us! And rather than just keeping this gorgeous fabric for our Snuggle Beds, we also use the Faux-Fur Fleece to create our Faux-Fur Fleece Day Beds (a pillow-style luxury dog bed mattress), and our gorgeous Faux-Fur Fleece Comforters. Faux-Fur Fleece Comforters are perfect for the sofa and fold up nicely so they're fab for travelling or a trip to the pub for lunch too!